BOSS Athleisure Sonic Runn Trainers In Navy, A white lace fastening and a navy suede lace stand. Dark blue synthetic uppers with a navy suede overlay on the toe. The signature HUGO BOSS logo printed on the outstep panel in silver. A navy leather padded tongue with the signature HUGO BOSS logo embossed at the top in navy. 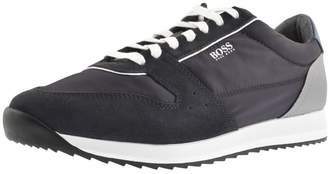 A blue leather panel on the heel which features the signature BOSS HUGO BOSS logo printed in white with a larger panel beneath in grey. A white foam midsole and a slim black rubber undersole. Part Of The Brand New Collection Of HUGO BOSS Shoes, Flip Flops And Trainers Live.